I am woefully behind with 23 Things owing to work and annual leave so I’m going to try and catch up with a few quick and dirty posts. Thing 9 is Google Hangouts and Collaborate Ultra and I did actually manage to dial into the live sessions Charlie ran a couple of weeks ago which were a lot of fun. I’ve worked remotely in one way or another for most of my career in ed tech, either working from home, working for distributed organisations, or working on projects with multiple international parters, so I’ve lost count of the number of remote collaboration tools I’ve used over the years. Here’s a brief run down of the way I use some of the current crop of tools. Still my favourite for one to one calls and personal conversations. I use Skype routinely on both my laptop and my phone and would be lost without it. I tend to use Skype for audio calls, text chat and transferring documents and images, it’s not often I make video calls. The downside of Skype is that it’s still flakey with more than a few people, so I tend not to rely on it if there are more than about four people on a call. Also the way Skype updates its interface and randomly hides features is annoying as hell. I can’t say I was impressed with Google hangouts in the early days. I remember having a call with a Google project manager in the US not long after hangouts were launched and they insisted on using a telephone conference line rather than a hangout, which kinda spoke volumes. Initially I found them really flakey and in my experience there are often problems with scheduling and people getting into hangouts. 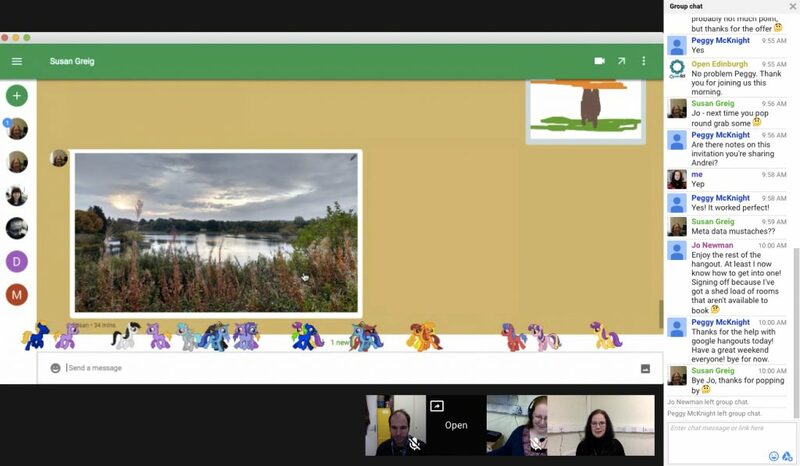 Having said that, things have improved, the interface is nice and clean, and once you’re in I find that hangouts are pretty robust. You can only have up to 10 people actively participating in a video hangout which is an obvious limiting factor, though you can have a much larger number listening in. One nice feature is that you can stream hangouts directly on to Youtube which makes them a useful broadcasting tool. Here’s a link to an ALT Community Call which essentially involved Martin Hawksey interviewing me in a hangout and streaming it directly on to Youtube. 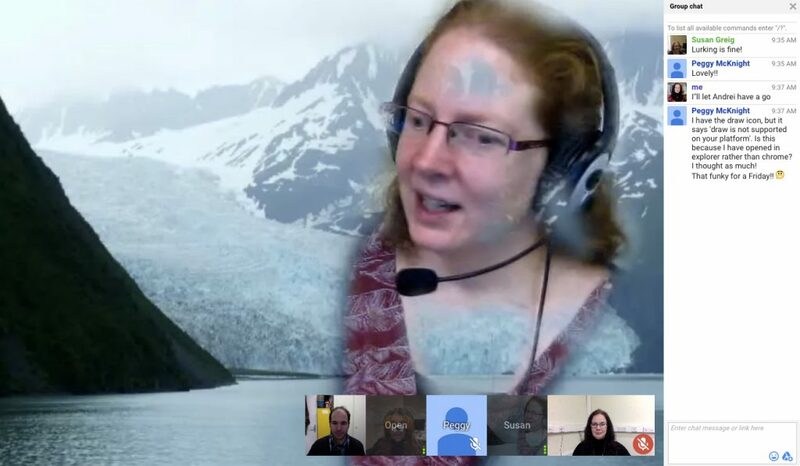 So I tend to find hangouts are useful for project meetings, small committees, and broadcast interviews. Also filters and ponies. I’ve been using various incarnations of this tool since the dawn of time and it’s never been exactly user friendly. Anyone else remember the days of having to install Java before you could run the damn thing? No, not that version of Java, this version of Java. *sigh* However there’s no denying that Collaborate is very useful indeed for more formal online collaboration, particularly webinars and online lectures, which may have a large audience. 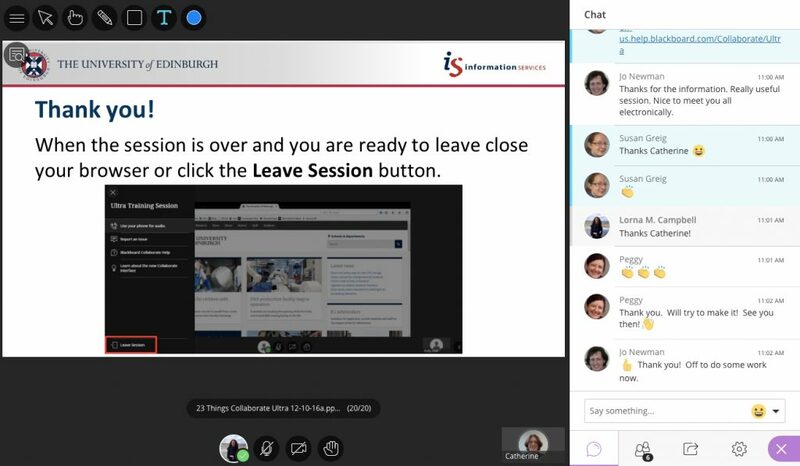 In my experience you need at least two people to run a successful Collaborate webinar, one doing the talking and one watching the chat window, and if you’ve got someone else acting as administrator then that’s even better. Of course to use Collaborate Ultra you need a subscription, but if you have access, it’s a very useful tool indeed. This entry was posted in 23 things and tagged 23 things, 23ThingsEdUni, remote working. Bookmark the permalink.